Now they can celebrate. The Seward County Saints were pleased Saturday night to learn they had won the Jayhawk West after a Hutchinson loss to Barton. But Seward was coming off a one point loss at Cloud and faced a five hour bus ride home in the wee hours of the morning. But Wednesday was the night to celebrate. Seward beat Pratt 72-69 and won the Jayhawk West by two games. 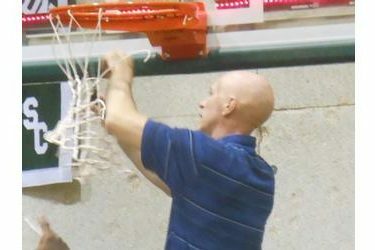 This was their fourth consecutive outright Jayhawk West title so the Saints celebrated by cutting down the net on the east basket in the Green House. It certainly wasn’t easy Wednesday night. Seward trailed much of the game including 40-36 at halftime. Evan Allen swished two big three pointers late to help the Saints hold off Pratt who shot 54 percent against the Saints and maded 9 of 18 three pointers. But Seward executed enough on offense themselves making 50 percent of their shots and sinking 15 of 19 free throws. Niem Stevenson, who scored two points at Cloud Saturday, poured in 30 Wednesday. Allen and Malcolm Hill-Bey added 10 a piece. The Saints are 21-9 and finish 11-3 in the conference while Pratt’s Beavers are 18-12 and 8-6. The Saints will be featured during the Green Line Thursday night at 6 at Billy’s on 1270 and kscbnews.net. Seward begins the Region 6 Tournament by hosting 15-15 Cowley Saturday night at 8 on B107.5 and kscbnews.net. Tickets are available at venues which can be found at Sewardsaints.com.